Post all your loose variations, your MOCs; SW, ESB, ROTJ, POTF, foreign, bootlegs, prototypes and similar. Please try to use the new Rebelscum picturehosting feature. This makes these FOTW threads a valuable resource by eliminating dead picture links. You can use the "Photo"-option (at the UBB Code links) to add a linked thumbnail. Thanks! Link to the First FOTW of this figure. 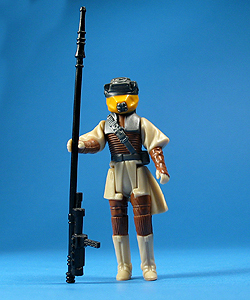 Link to the Rebelscum Archive Entry for this figure. Link to the FOTW Master List. This is the first Leia Boushh with unpainted helmet that was documented and the one that served for the basis of the majority of the research Dave and i did on the subject. I ended up with a couple more to further the research (which i have since sold) but this is the first! To sell or not to sell haha. Awesome focus, Mats! That Lili Ledy Boussh is beautiful! WOW!